Wonder material graphene could help detect the presence of drugs or toxins in the body or dramatically improve airport security, University of Manchester researchers have found. Writing in Nature Materials, the scientists, working with colleagues from Aix-Marseille University, have created a device which potentially can see one molecule though a simple optical system and can analyse its components within minutes. This uses plasmonics – the study of vibrations of electrons in different materials. The breakthrough could allow for rapid and more accurate drug testing for professional athletes as it could detect the presence of even trace amounts of a substance. It could also be used at airports or other high-security locations to prevent would-be terrorists from concealing explosives or traffickers from smuggling drugs. Another possible use could be detecting viruses people might be suffering from. Graphene, isolated for the first time at The University of Manchester in 2004, has the potential to revolutionise diverse applications from smartphones and ultrafast broadband to drug delivery and computer chips. It has the potential to replace existing materials, such as silicon, but University of Manchester researchers believe it could truly find its place with new devices and materials yet to be invented. The researchers, lead by Dr Sasha Grigorenko, suggested a new type of sensing devices: artificial materials with topological darkness. 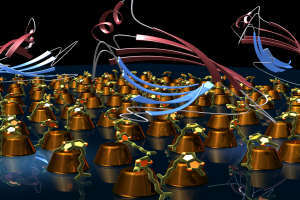 The devices show extremely high response to an attachment of just one relatively small molecule. This high sensitivity relies on topological properties of light phase. To test their devices, researches covered them with graphene. They then introduced hydrogen onto the graphene, which allowed them to calibrate their devices with far superior sensitivity than with any other material. Testing for toxins or drugs could be done using a simple blood test, with highly-accurate results in minutes. The researchers found that the sensitivity of their devices is three orders of magnitude better than that of existing models. The academics, from the School of Physics and Astronomy, hope the research will show the practical applications from an emerging area of research – singular optics. Dr Grigorenko said: “The whole idea of this device is to see single molecules, and really see them, under a simple optical system, say a microscope. “The singular optics which utilise the unusual phase properties of light is a big and emerging field of research, and we have shown how it can have practical applications which could be of great benefit. “Graphene was one of the best materials we could have used to measure the sensitivity of these molecules. It is so easy to put the hydrogen on to it in controlled way. Professor Andre Geim and Professor Kostya Novoselov won the Nobel prize for Physics in 2010 for their groundbreaking work on graphene. The paper, Singular phase nano-optics in plasmonic metamaterials for label-free single-molecule detection, by V. G. Kravets, F. Schedin, R. Jalil, L. Britnell, R. V. Gorbachev, D. Ansell, B. Thackray, K. S. Novoselov, A. K. Geim, A. V. Kabashin and A. N. Grigorenko is available on request from the Press Office. Dr Grigorenko is available for interview on request. Please contact him directly over the weekend at sasha@manchester.ac.uk. Images of graphene and more information are available at www.graphene.manchester.ac.uk/. Images illustrating this work are available from the Press Office.